The Marketplace at Seminyak Village welcomes you to Bali’s artisanal fare. We are a family-oriented market that nurtures the entrepreneurial spirit of the island, showcasing its deep artistic roots. Over 20 traders will share their ideas with you in a relaxed and festive environment. Made by local artisans in a humble boutique factory in Central Java, Batik Wayang offers a selection of hand-onto-silk contemporary batik prints on the finest silk. All prints are made using traditional techniques for the colour-dyes, transforming them to a collection of products from shawls and hand fans, all the way to blankets and decorative throws. A collective of 4 brands, made and produced on the Island of the Gods, Down to Earth showcases a beautiful selection of quality products. From wooden and bamboo sunglasses and phone cases, to a range of jewellery and ethnic-inspired cases for technology, all brands and products are made using only sustainably grown materials and socially responsible production methods. In collaboration with Indonesian Emporium Design Curator, Eric van Bruggen, the best selection of carefully-sourced Indonesian oleh-oleh at Indonesian Emporium promises a journey through Indonesian culture, presented unlike any other on the Island of the Gods. Discover traditional souvenirs, exotic trinkets and cultural gifts. 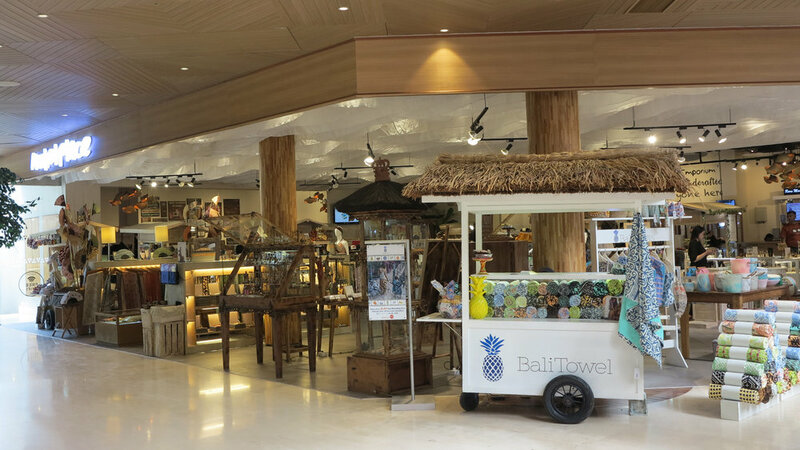 From a bevy of basketry and hand-crafted bamboo accessories, to a beautifully crafted selection of home-and-glassware, Indonesian Emporium is set to bring you a new retail experience of all things Indonesian. Made in Semarang, Indonesia, starting off as a home industry in 1998, founder Wenny Sulistiowaty Hartono initially cultivated the idea of creating her own brand after years of experience in the export industry. Webe Bags now offers a collection of quality handmade woven bags, wallets, clutches and scarves, available in multiple cities across Indonesia, setting the bar that inspires Indonesian creativepreneurs. Handcrafted by experienced silversmiths, the name “Saka”, that comes from the word “Caka” that means the Balinese Hindu calendar, clearly symbolises the everlasting pieces designed with modern appreciation of old jewellery-making techniques and influences. Le Souq has an extensive collection of interior design products and combines these in a very “now” way. All products are hand made from natural, high quality materials, like teak wood and skins. All fabrics used are either silk, pure cotton or linen or a mixture of these two.The design of the products distinguishes itself by a unique mix of different styles and cultures. The owner of Le Souq has travelled the world and lived in Europe, the US, Africa and Asia. She has assembled a collection of interior design products that reflects the best of all of these worlds. Derived from home industry , in the early 70s was established traditional Balinese handicraft fan named Dewi Ambha or goddess Ambha .Today , with a fresh new look and name : Wiracana , there are 60 % of their products are produced by machine. They continually improve the quality of their products to meet market demand at that time came from foreign and domestic tourists. Aryuna Bali Jewelry places their efforts into producing highly creative pieces of art, the combination of distinctive shape, texture and unique design produces masterpieces that exudes beauty to who wear them.